Clean hardwood floors without a messy mop with the model RJ-12 RainJet. This complete system includes a sponge, squeegee, and Floor Cleaner. 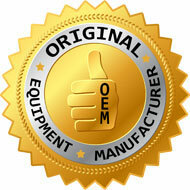 This accessory fits the Black Series (E2 Type 12) system. It can also fit other E2 Type 12 versions, read notes below. The Rainbow RainJet floor cleaning attachment uses the natural cleaning power of water to remove ground-in dirt and grime from tile, linoleum and other hard surface floors. Interchangeable sponge and brush attachment so you can scrub away embedded dirt and debris. If you are trying to use with a manufacture date between 1998 and 2010, you may need two or even three of the related items listed on the "Related Items" tab. If you are trying to pair the RainJet to your older Rainbow that is not the Black Series, please call our technical support team at 800-640-2033. The RainJet and Squeegee attachment can get a lot of work when you combine pets, children, and bare floors. 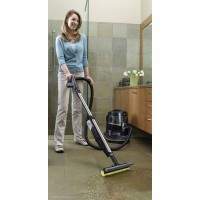 The soft sponge is designed for medium to light jobs that does not require a lot of scrubbing. Click here for Clean Floor Solution. Original replacement squeegee brush attachment. Best for use in areas where heavy soil and dirt is stuck to floor. Now in a 2 ounce trial size. 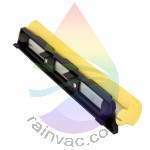 The perfect solution for the RainJet and squeegee attachments. Has a very low sudsing so no worry of it becoming an issue in the water pan like other products could be. Owner's manual written in English for the model RJ-12 RainJet. This accessory was introduced in 2011 and works directly with the "Black" model Rainbow system. Standard self docking electrified wand assembly for the e2 Black (E2 Type 12) version Rainbow system.